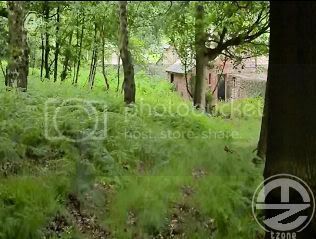 Jason spots a (what they think is) an abandoned farmhouse. The explore it on the way to fruit picking - for money. However they cannot find any food other than a rusty tin of baked beans, Sinead gets locked in the lavatroy, and they have to kick the door in the rescue her. Bart and Jason fool about trying to scare each other, and go down into the cellar to try to find the electric mains switch, whilst there there is an intimate moment whilst Jason clear cobwebs from Bart's hair. Sinead of course spots this and says you win Jason. 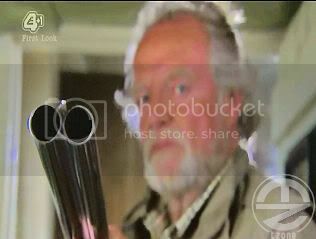 The pair run upstairs and are confronted with an angry homeowner with a shotgun! Jason and Bart are forced into the cellar and locked in. Jason fakes an asthma attack to attempt and escape but the framer is having none of it and throws Bart to the floor smashing his head and being knocked unconscious. Whilst Bart is out - Jason removes has T and makes a bandage, holding Bart in his arms he tells him how much he cares for him. Bart hears this and comes around. "I'd never have said those things normally - I thought you were out cold!" Nevertheless they touched Bart and he says that he cannot stop thinking about Jason. To which Jason tells him to stop as he cannot handle anymore rejection. Bart runs hot and cold and Jason needs commitment. Bart leans in and kisses him. The camera pans up and just outside the cellar window Sinead is sitting crying having heard all of it. Will she leave them to rot of go for help? Sinead comes back to release the pair just as the farmer is out shooting. Sinead is heartbroken. Bart attempts again to defend his actions by suggesting he was kissing Jasmine. Jason feebly attempts to fight Bart to the ground. "I am so Sorry(! )," says Bart. Sinead comes back with, "what is it she's got that I haven't you want me to cut my hair off and flatten my chest is that it?" And pulls at Jason's shirt to reveal his binder, she sees his arms, (the cuts) what's that? Continuing to use female pronouns she carries on attacking Jason. "I'm a boy" he replies! "You'll never be one!" Responds Sinead. Sinead - "are you gay?" Bart - "no!" "I don't know!" Sinead stands and tells Bart it's over. They head to the main road to hitchhike and flag down a bus - as you do, who for some reason was happy to take them home for free if only! It is soap world. They all enter their homes to the music of Adele - Make You Feel My Love. They all break down and cry. 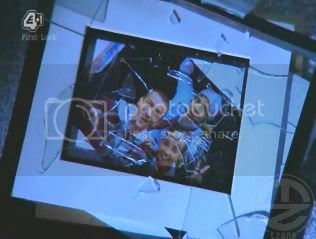 Jason smashes a picture of them and cries. They are back and waking up confused about this new love triangle. Bart visits Sinead and they sit together. "I love you!" Says Bart. "What about Jason?" Responds Sinead. "That the point where you are supposed to say he doesn't matter!" Retorts Sinead. "He doesn't!" replies Bart woefully. "Too late Bart! If you come anywhere near me again I'll tell everybody about what happened between you and Jason in the Farmous, just try me!!!" Jason earlier was a bit lost getting a paper and some confectionery from the newsagents when he was asked by a friend, Hey Jason are you looking forward to Thursday? Your exam results, duh?! You must be confident and calm that's good. Jason walks off. Not only has he lost Sinead he has retrieved his scooter, then was reminded that his exam results are due soon. B - "She isn't coming back she caught me kissing someone else!" So there's another girl? - [This I feel is a little contrived as it is unlikely she'd say this unless she suspected he was gay for example]. "Can't Jason help you get Sinead back?" B - "Jason's done enough!" "She'll come rounf they always do!